Did I just say a serial killer? Well, yes. 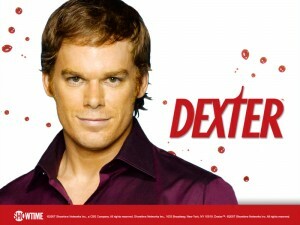 Because Dexter Morgan is no ordinary serial killer. And if you don’t know who or what Dexter is, check it out on Showtime, or rent the first seasons on DVD, because it’s tremendously gripping and moving and fun, and every week leaves you thinking, Am I really rooting for a serial killer to not get caught? This last week’s episode—without giving much away to those of you who TiVo or save up to watch marathons—had one of the most touching, tear-inducing scenes I’ve seen in four seasons when Dexter’s sister Deb stood in a parking lot crying because she thought she was “broken” in relationships. There was no happy ending line that made everything right for her heart this episode, but I’m mentioning it because that’s sometimes how life is: Sometimes things hurt so bad you think you’ll never get over it. Sometimes bad things happen that you have no control over, or you can’t explain. And sometimes we all feel “broken,” like we can’t get anything right and we’re doomed to failure and feeling alone. But please know that if you ever feel as low as Deb expressed in this episode: Tears and fear are part of the path of life—and proof that you’re healthy and emotionally advanced. You can’t feel great happiness unless you’re able to feel great pain. And the way I see it, if you’re feeling pain now, it means the happiness is on the other end of the seesaw just waiting to take its turn. Whether you’re facing a heartwrenching, life-altering time or just having a really, really, really bad day when it feels like your half-orange in love will never come your way, it’s part of life’s path for you. If you can feel this deeply in sadness, you can feel this deeply in love. And Whitney’s right: You were not built to break.